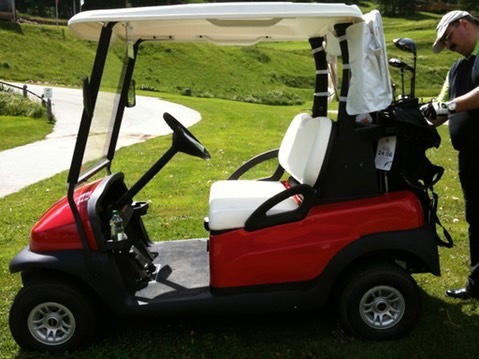 We have started in 2010 with this, and are still on the way to get our first handicap. You can follow us on Twitter as well. 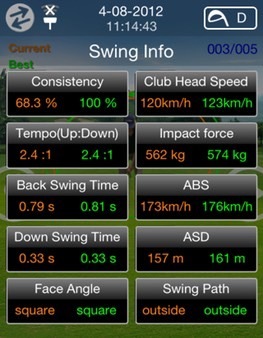 The new GSA Pro Golf Swing Analyzer for Apple iPhone is like a reduced Trackman to record the swing motion and sends about 10'000 measured data points streight to the iPhone APP to analyze and visualize the swing. The device needs to be plugged at the end of the club, where the hole is from the grip. Then it has to be alligned with the mark on the grip for the correct position. 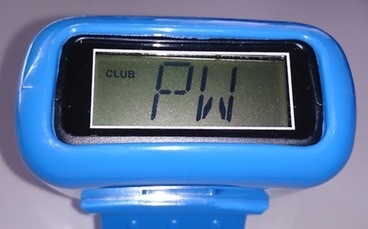 After this, the device is ready and the iPhone APP has to be started and the club has to be selected to use. 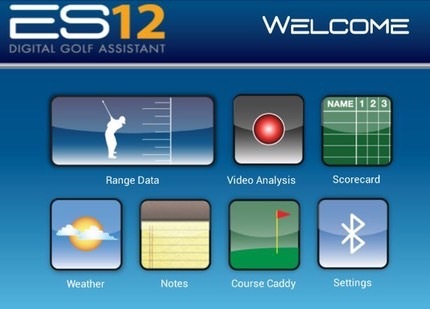 After this, the device will record every swing and transmit the data after the swing directly to the APP. 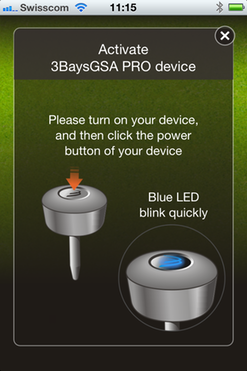 Befor the swing, you have to make sure, the blue light from the device is continiously on, then the device is ready. Sometimes the club has to be positioned in the pre shot position for 2 seconds, that the device recognizes that the player is ready to swing. 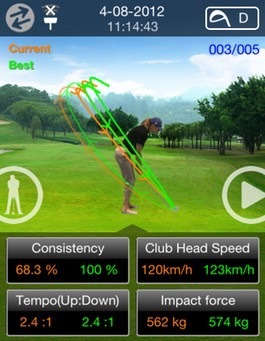 There is not intervention needed from the user after the swing, so it's possible to hit a lot of balls with the same club without watching to the iPhone. After this, the swings can be reviewed. The swing can be reviewed from the front or from the side. 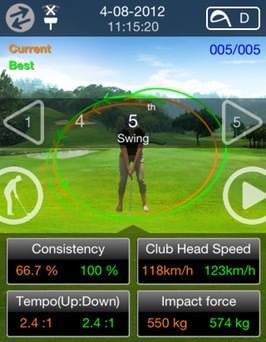 The swing can be reviewed in realtime or in 1/4 or 1/8 slow-motion. The body showed is static and has always the same moves. The relevant point is the end of the orange line which represents the current swing. The green line ist the best swing selected from the past. To switch beween the recorded swings, just swipe with the finger to the right or left. 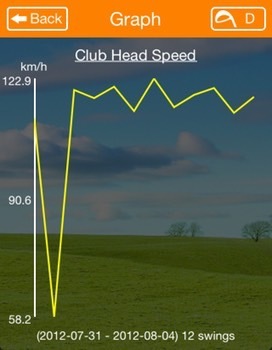 Club Head Speed and ASD (Attainable Shot Distance) are very important for each golfer. As the device is not able to recognize if the golf ball was hitted correctly, this is only a theoretical value. If you hit the ball perfectly, then it would fly that much long. We did several tests and the ASD looks very accurate. The APP is done very well and it works very stable and fast on an iPhone 4s. The transmition of the data is stable as well if the distance to the device is not to far away. Best is to place the iPhone into the ballbox in front of you where you practice your swings. 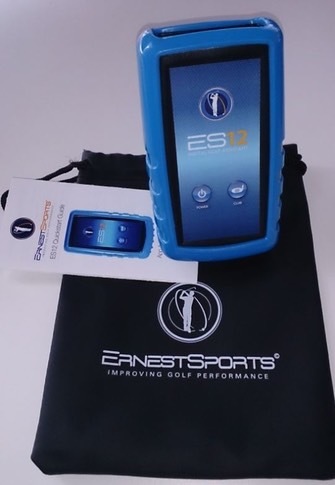 The device works very well and can help you the make your swings more stable and consistent. It will not help you to hit the ball correctly, but with a perfect swing, it's easier to hit the ball. 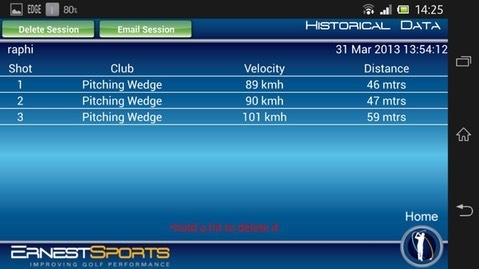 It will save you the money for the Trackman sessions and waittime to use the Trackman infrastructure. I can recommend this utility for beginners and high handicaper's like me. 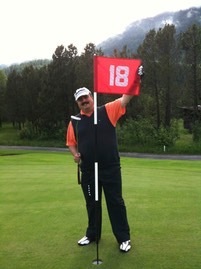 The device shows exaclty what my Golf Pro is always telling to me. But to be honest, it will not replace the regular Pro sessions you need to go forward and lower your handicap. After the first round with the Golf Buddy Voice clipped on my hat, I can say, it's a really usefull and simple device to use. At the first tee we enabled both our Golf Buddy Voice devices. We have used it with the german language setup. After one minute the device told me, I should wait as the course data will be loaded. After another 20 seconds, a friendly female voice told me: "You are at hole one." After I pressed the main button she told me: "Hole one 292 meters". We were suprised as we both were on the same tee box and we had quite signifficant different distances to the hole. We then saw, that one unit was setup with meters and the other with yards. At this point we both recognized that we both had not the "Quick Start Guide" with us. I was able to find out by myself, how to change from yards to meters on the wrongly set device. The device works very well with the selection of the holes. As our Home course is very small, and we had to go from hole one to hole two in between the tee boxes of hole 9, the Golf Buddy Voice told us "You are at hole nine." while passing the tee boxes. 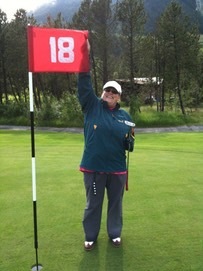 But arrived at the tee boxes of hole two, she selected the correct hole and told: "You are at hole two." Every time you push the main button, the device tells you the hole and the distance to the green (front, center or back). In German, there is not enough pause (silence) between the announcement from the hole and the meter. Serveral times I understood on hole five, that it's over 500 meters to the green. "Hole five hundred twenty one meters." 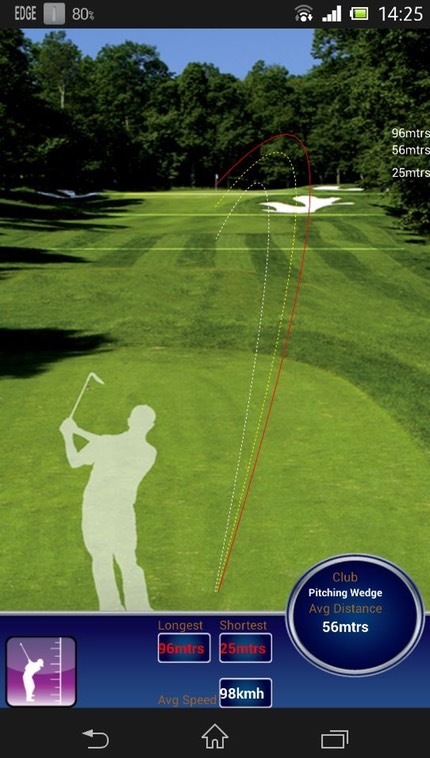 Very good device to tell you the distance between you and the hole. Hopfully the negative points can be changed with an update to make this to the perfect Golf Buddy Voice. 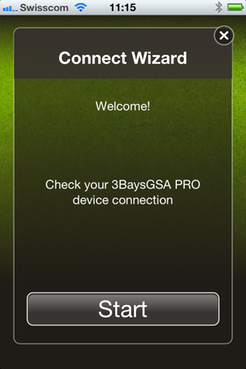 More information about the device you can find at Golf Buddy. 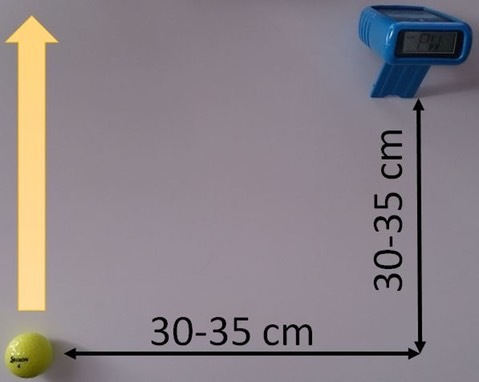 We received a new gadget for measuring the distance to the hole.